There is a fantastic, information-packed permaculture convergence coming up at the beautiful Sky Mountain Institute in Escondido. It will be two days packed with great information for a very reasonable price; in fact, scholarships are available. Check out the website at convergence@sdpermies.com. On that Sunday I’ll be teaching a workshop about why its so important to plant native plants, how to plant them in guilds using fishscale swales and mini-hugelkulturs. 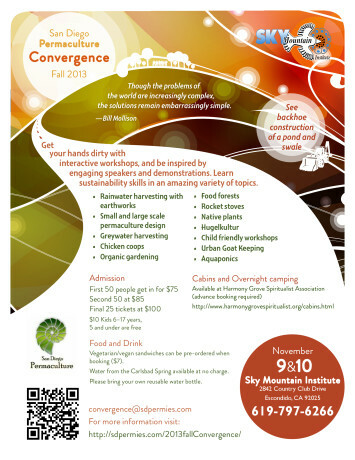 Come to the convergence and be inspired! Jook, Juk, Chinese rice soup, rice porridge, congee… these are many names for basically the same food, rice cooked with a lot of water. There are equally as many ways to fix this wonderful comfort food. Jook can be made with plain water and white or brown rice, then served with toppings such as cilantro, sesame oil, chopped peanuts, bits of cooked tofu, soy sauce, chopped hardboiled egg, preserved or cooked vegetables, chives… as little or as much as you’d like. Jook can be prepared with or without salt; I prepare mine without, then grind a little on the top when serving for that little burst of flavor. Jook can be served with cinnamon and sugar for dessert; this is especially nice for those who love rice pudding but don’t want to eat or can’t eat dairy. Commonly eaten as a savory breakfast dish, Jook is also a perfect food for when you are ill. Not only is it comforting and filling, but it is easy to eat for a sore throat, easy on a troubled stomach, nutritious, and if you are a victim of Montezuma’s Revenge (if you know what I mean), rice is very good for helping you to stop going. Ah-hem. Jook is a very good baby food for those little mouths that are just getting into semi-solids. You can find hundreds of different versions of Jook on the Internet. Many make it with part broth, part water. Some throw in fresh ginger, some cook bones in it for added calcium. Cooking it plain allows you to top each bowl up the way you want, which is what I do. 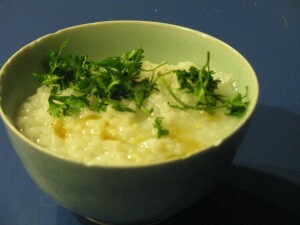 Leftover Jook can be mixed with water to loosen it up, or eaten in its more solid form. You can’t get a much easier comfort food to make that is so versatile. It is particularly good for celiacs (those who cannot eat gluten). With cooler weather upon us, make one dinner a Jook day! Jook, rice porridge, rice soup or congee, is a wonderful versitile comfort food. sesame oil, peanuts, fresh cilantro, chopped hardboiled egg, cooked tofu, seaweed, soy sauce, freshly ground salt and pepper, butter, cooked vegetables, pickled vegetables... leftovers. Also make it sweet with sugar, honey, cinnamon, nutmeg, dried fruit, chocolate chips! Turn down heat to a simmer and cook uncovered 2½ - 3 hours, depending on how thick or thin you want it. Serve hot in small soup bowls with choices of toppings. 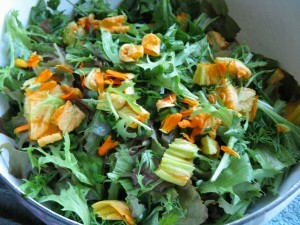 Crazy Pot Salad is what my daughter calls a main dish I make because it involves many different ingredients that vary as to availability. It always turns out great, though, which is truly amazing. It is a greens salad that also has cooked items and a balance of flavors, textures and colors that make every forkful slightly different. It involves both cold and hot ingredients, all thrown into the same bowl and mixed together to create a melded warm dinner that is as healthful as it is delicious. It is even good as cold leftovers the next day. 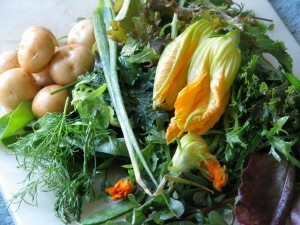 Fresh Greens: the more varied the better. 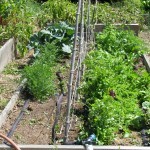 Fresh herbs such as dill, basil, chives and cilantro, along with arugula and a lettuce mix, work well. Don’t forget some iceberg for crunch. If you don’t have or want to use iceberg (a much maligned vegetable) then cut up fresh celery. Protein: Tofu, soy chicken strips (such as Morningstar Farms), soy bacon, soy tuna, etc. Beans such as garbanzo or Northern white work well. Using a couple types of proteins are tastier and more nutritious. Cook the protein and use hot. Starch: Pasta in small shapes, rice, or a cooked grain such as quinoa. Use the starch hot. 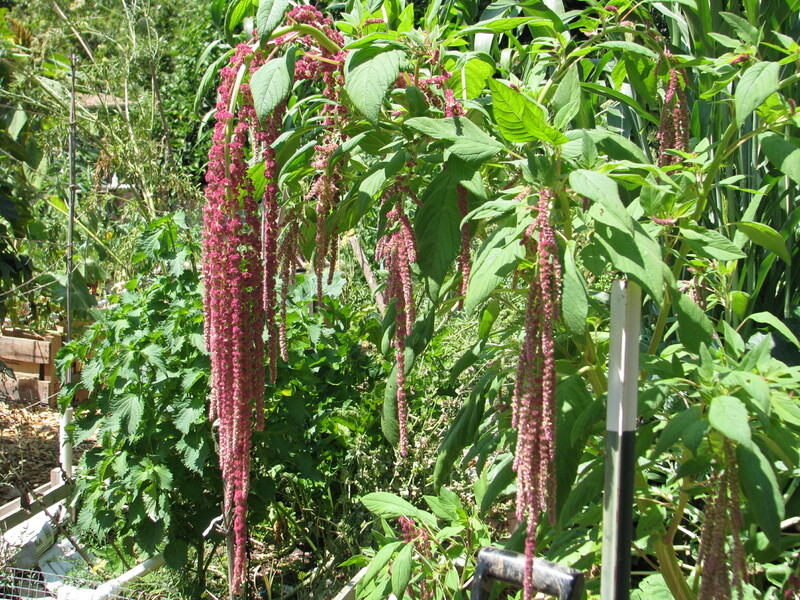 Quinoa (pronounced keen-wa) is high in Omega-3. Other additions: diced carrots, steamed tiny potatoes or potato chunks (hot), feta or cotija cheese (crumbly), marigold petals, nasturtium blossoms, squash blossoms, capers, heart of palm, mushrooms, pea pods, avocados, green beans fresh or cooked… whatever you have that you need to use. Look for colors to add. I can’t stand Bell peppers, but that is usually the go-to choice when people want to add color to anything. You can avoid the Bell pepper taste-takeover of your salad if you want with a little creativity. Stir-fry up some chopped red cabbage and throw it in with some raw carrots. Crunch: Nuts, such as pignoli (pine), cashews, sunflower seeds or almonds. Toast them in a little olive oil or in the toaster oven to bring out their flavor. Dressing: This salad just about makes its own dressing. I like to make Italian dressing with a packet of Lowry’s Italian dressing mix, using red wine vinegar and olive oil. Or I make the dressing as I cook, which I’ll include in the recipe. The cooked shiitake mushroom gives the olive oil a deep, savory note and adds a very interesting flavor and texture. Along with the pignoli nuts, chives and crumbled soy bacon, this makes a delicious subtle dressing that is mixed into the salad rather than adorned on the top. The hot starch, including the potatoes, will readily absorb the hot flavored olive oil. Remember, this is a salad of opportunity; use what you have and what you love, but keep in mind the different components, the shapes and colors of the ingredients, the texture and nutritional value. Bland foods such as the potato will balance strongly flavored ones such as arugula. This warm combination of greens and other ingredients make a balanced, delicious healthy main dish that can change with what you have available. 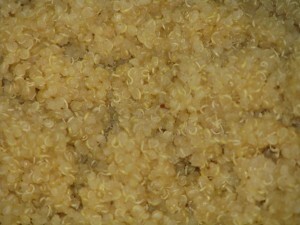 Prepare quinoa in medium saucepan using vegetable broth, according to the instructions on the box. Meanwhile, wash, dry and tear up fresh greens, herbs, iceberg and flowers. Put in large bowl. Crumble about four tablespoons Cotija cheese over greens in bowl. In frying pan, heat a tablespoon of olive oil and stir-fry the soy chicken strips until browned (if you have flavored olive oil, such as citrus or basil, use that to cook these). Add hot soy chicken strips to bowl. In same frying pan, heat ⅛th cup olive oil on medium high. Chop shiitake mushrooms and add to frying pan. Cook mushrooms on medium-high heat until they are almost crunchy. 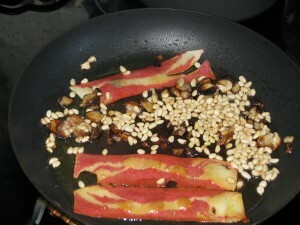 Add soy bacon strips and pignoli nuts. Stir nuts until they are browned (watch so they don't burn). Flip bacon and remove when browned. Pour contents of pan on mixture in bowl. Crumble bacon strips and add to bowl. Add steamed potatoes, quartered to bowl. Toss contents of bowl until well mixed. Heavy ingredients will sink to the bottom, so be sure to mix well. 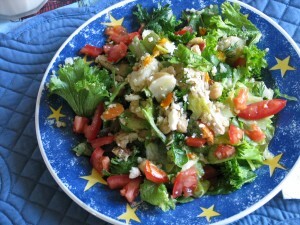 Plate the salad and garnish with chopped tomatos and more cheese, if using. “When planting seeds plant four in a row: one for the mouse, one for the crow, one to rot and one to grow.” (unknown). I know what you’re thinking; you’re thinking, “Oh, no! Not more about peas again!” Well, yes, a little more about peas. It was time for them to go. 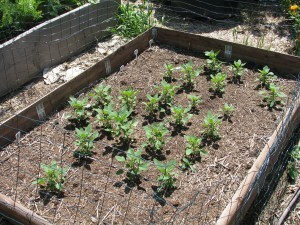 I grew most of them from old seed just to use it up and to set nitrogen in the soil, since they are legumes. 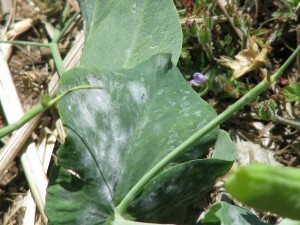 Some plants even had powdery mildew on them, which surprised me. 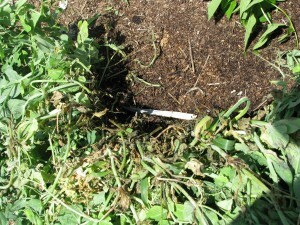 I had to cut the plants off at the roots instead of doing it the easy way and pulling up the whole plants. Since I’d hurt my right wrist a few weeks ago and I still haven’t allowed it to heal enough, the cutting wasn’t a fun job. It was worth it, though. 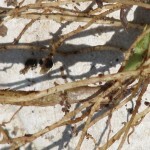 I left the roots with their nitrogen-fixing nodules in the ground where they would do the most good. 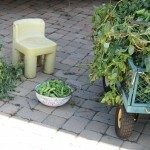 Then I took all the pea vines up to the driveway, set up a chair, put on shorts and stuck my pale legs in the sun, plugged in an audiobook, and spent about an hour and a half tearing pea pods off of all the vines. That night after dinner I began sorting through the pods and shelling them. I’m still not done. I managed about half a big bowl of peas, which I sleepily shoved into the refrigerator before stumbling up to bed. My son was very calm in the morning when he told me about his surprise when he went for a midnight snack and spent about half an hour gathering up peas from the floor and adjacent rooms. I worked on more peas tonight. I’ve already frozen a couple of bags for our use; the rest will be frozen and used to feed the tortoises and chickens. All those pods and vines will combine with trash cans full of weeds I’ve been pulling along with kitchen trash to reconstruct my compost pile. But there is life beyond peas. There are beans! 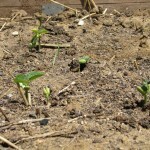 I’ve planted several types of beans this year. 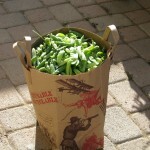 Fresh green beans as well as soup beans and pinto beans. I’ve created two new raised beds and set them off from the rest of the garden. In them I’ve planted sugar baby watermelon, green melon, sugar baby pumpkin, and butternut squash. 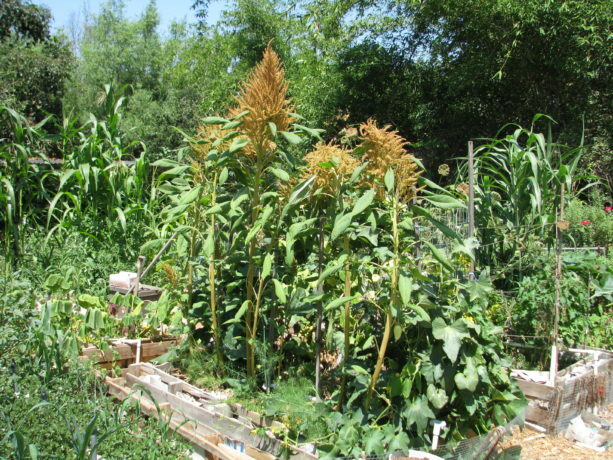 Here’s an interesting piece of trivia: most gardeners have heard about ‘the three sisters’, which are the Native American pairing of corn, beans and squash. Actually, it should be four sisters, at least for Southwest Indians. The concept of the ‘sisters’ is that they form a complete plant ‘guild’. In other words, these three planted in combination produce more food than any one planted alone. The corn provides a trellis for the beans, the beans are a legume that fix nitrogen in the soil with nodules on their roots that feed off of sugars secreted by the corn roots (all this going on beneath your feet! Yikes! ), and the squash forming a cooling, weed-suppressing ground cover that also deters raccoons (notorious corn-eaters who don’t like to walk through the vines). 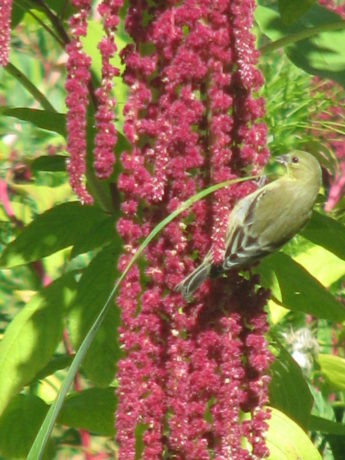 What is missing is a plant to attract and feed the pollinators. 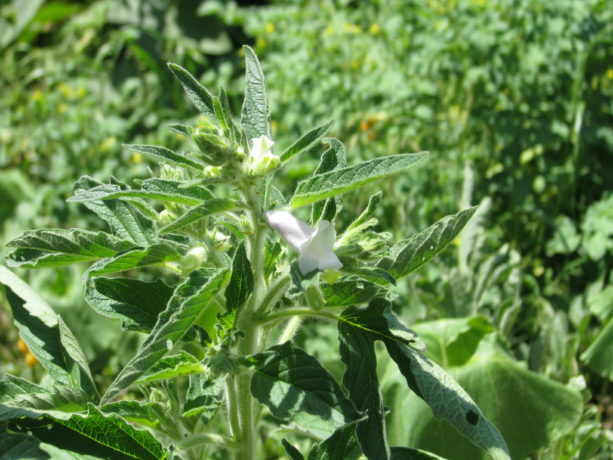 In the Southwest Anasazi settlements it was Rocky Mountain bee plant (Cleome serrulata), which has edible parts to it and fixes iron (the Anasazi used it as a dye plant as well as food). 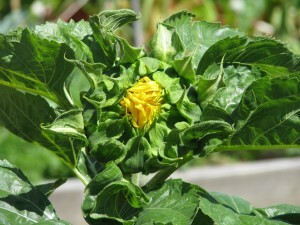 With an edible plant guild, we feed the soil and the pollinators as well as ourselves. 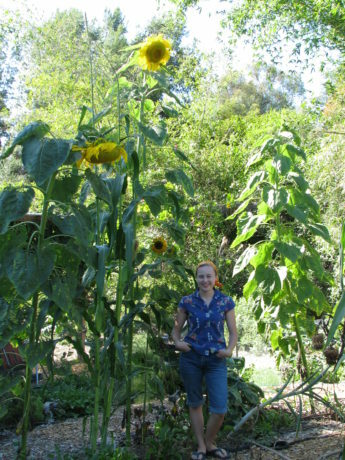 You can read more about this in the fantastic book on permaculture by Toby Hemenway, Gaia’s Garden. 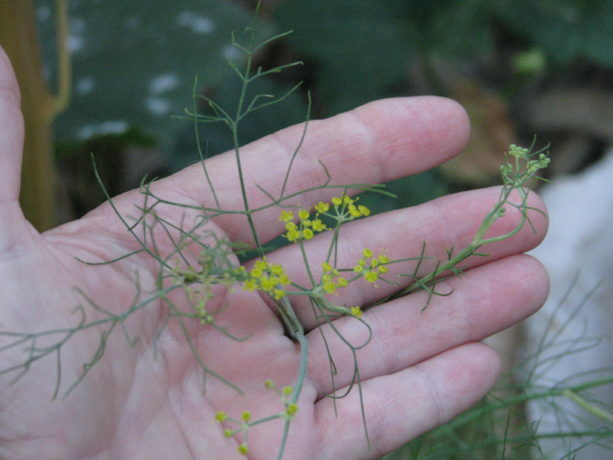 An excerpt is right here: http://patternliteracy.com/the_three_sisters_or_is_it_fou I’m trying my fourth sister as dill weed, which is an excellent bee plant because of it’s small umbellate flowers. Dill also goes well as a flavoring for corn, cucumber and squash, and usually plants that complement each other taste-wise do well planted together, such as basil and tomatoes. Speaking of which, my garlic/shallot/tomato and basil bed has taken off with the warmer weather. These are slicing tomatoes; I have planted Roma and a yellow variety in other beds. 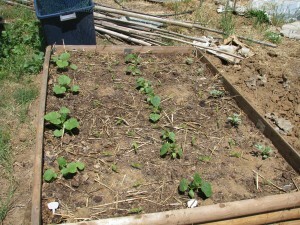 Where the peas have come out, the broccoli, carrots, parsnips, lettuces, endive and cilantro are doing well. I’ve planted some small eggplant sprouts and more carrot seed so there is a continuous supply. Organic sweet corn will go into this bed, which will provide shade for the lettuces. Corn of different varieties must not come into silk simultaneously or they will cross-pollinate. 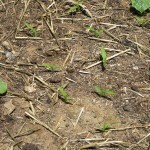 The baby corn in the other bed will mature earlier by nature and by planting times. Those little corn ears can be eaten fresh or left to harden to be used for popcorn. The whole ear can be put into a microwave, for those of you who have such a newfangled contraption (I haven’t owned a microwave, um… ever!). We’ve had new visitors to the garden. 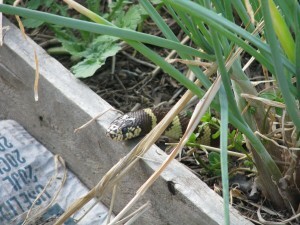 Besides my gopher snake friend (see my post Unsticking the Snake of May 14th), who has been seen again, and a longer gopher snake, my son and I saw a king snake whipping down a gopher hole in the lower Bee Garden, and then today this fellow came through the Chicken Tractor then through the Swiss chard and onion bed, and across the property. "So good to rest my weary head for a minute!" I’ve only seen one king snake in the yard who shows up in the height of summer to look for mice under the bird feeders. The standing water in the pond and the disturbance of the soil has attracted more of these friends, especially since my dogs are elderly and aren’t ‘making the rounds’ like they used to. 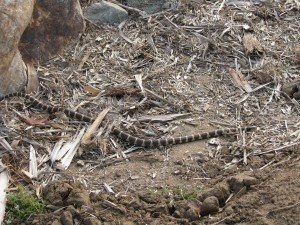 Kingsnakes are a little more tetchy than gopher snakes, and will eat other snakes including rattlesnakes. They can be striped or banded, even in the same clutch of eggs. Just like siblings with different hair colors. 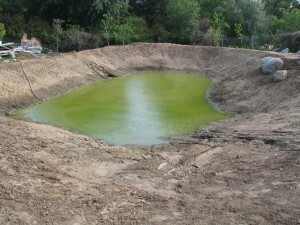 Speaking of ponds, the standing water in the lower pond hasn’t receded very much, but has had an algae bloom. I’m going to have to have a well drilled on site, and have spoken with two well drillers and have received one bid, and am waiting for the third day for a call back. Honestly, is there so much work for some people in this economy that they can’t return phone calls or show up to appointments? 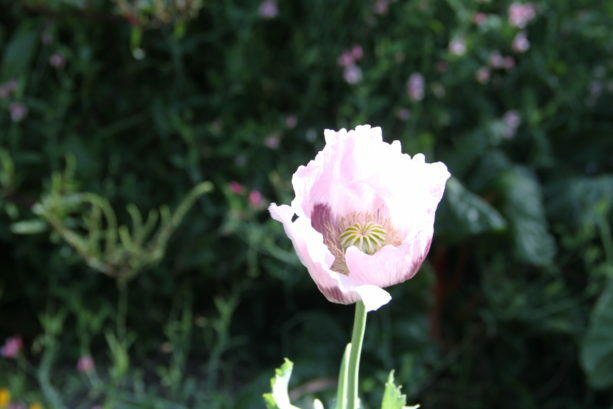 During this gardening adventure of the last few months there have been several people of different occupations who just haven’t kept appointments or returned calls although they are still in business and initially shown interest. What’s up? Grrr. 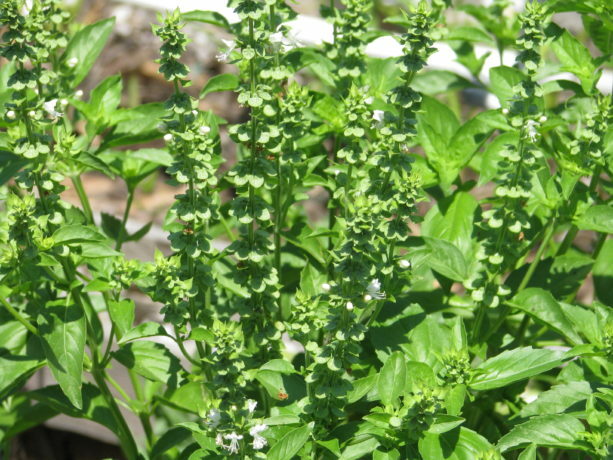 The quinoa (pro: keen– wah) is doing well, and the potatoes are ready to harvest. Although I planted a whole packet of sunflower seeds throughout the property, only this blue jay-planted one in my strawberry bed came to anything. It looks like a puckered face! Dr. Barnard goes on to give these interesting tidbits: The labels on fresh produce carry a four-digit standardized code for cashiers to look up the price of the item, called a PLU (price look-up). If the code is preceded by an 8, it is genetically modified. 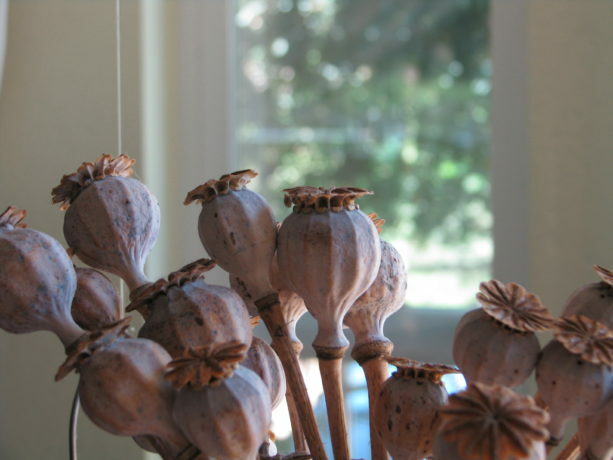 If preceded by a 9, it is organic, and organics cannot be genetically modified. 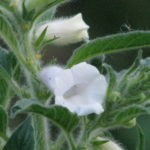 So watch your tofu packages if you don’t want GM soybeans. Since becoming a vegetarian some sixteen years ago, I’ve been a label reader (even now when it requires pulling out my glasses or holding a can at arm’s length!). The amount of sodium in foods is outrageous, as is the amount of sweetners such as corn syrup. High amounts of salt and sugar is in there not for taste, but for its addictive qualities. When you eat salt or sugar, just like drinking caffeine, you crave more. As a vegetarian, it’s amazing what meat products are slid into foods, even those toted to be vegetarian. Now there is a more dangerous enemy than bad nutrition in packaged food. In my opinion, it is that of GM food and heavy herbicide and pesticide use. Even more reason to shop locally and organically, or to grow as much food as you can, and read all the labels. I am an ethical vegetarian, meaning that I decline to eat animals because I am protesting their horrible treatment and slaughter. GM animals are bred to continuously give milk, to grow enormous, to provide more of what humans eat off of them, despite the physical agony it brings. That coupled with already nightmarish living conditions is a monsterous state of affairs. Then humans injest the modified DNA, the herbicides that the animals eat that was sprayed on their food, and the pesticides that was sprayed directly on the animals. It is not a practice of which I will be a part. Okay, I’m stepping off my soapbox now. As promised, I have a curious, unrelated photo. I have to balance reality with humor to keep sane This was taken by my daughter as we left the area on our recent Oregon sojourn, and we ask ourselves, “Huh?” A really big blowhorn faced the wrong way? 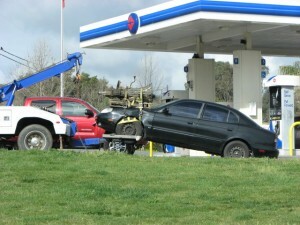 A jet engine, faced the wrong way? 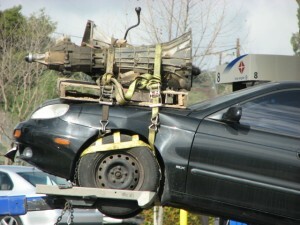 A hood ornament…. faced the wrong way? Something unusual that fell out from under the car? A neutron accelerator? I love the care of placing a skid under the thing to protect the hood, but cinching the straps so tightly it dents the sides! Another funny incongruency in life, which keeps that humor in living. Any suggestions as to what? Or better yet, why? 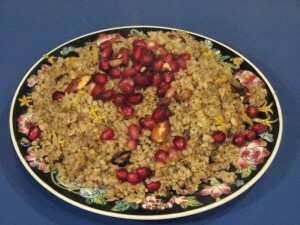 Inspired by the wonderful fruit and nut studded rice dishes of the Middle East, I came up with this and it really worked! Kasha is roasted buckwheat groats, and if you have not tried it, you really should. I find some grains hard to get through sometimes, but kasha is just plain yummy. It is also very low in fat, and high in protein. It can be made sweet for breakfast, or savory as a side dish or stuffing. In this recipe, the kasha plus the almonds and egg make it an even better protein source, and with the pomegranate seeds and seasonings, high in antioxidants and very low in fat and sodium. Can’t beat that with a stick! Boil water and oil in a medium saucepan that has a tightly fitting lid. Lightly beat egg in a bowl with a fork and stir in the kasha kernels to coat. In a separate skillet, heat egg-coated kasha over high heat, stirring constantly until the egg has dried and the kernels are more-or-less separate. Quickly stir kasha into boiling water. Cover tightly, reduce heat and simmer 7-10 minutes until kernels are tender and liquid is absorbed (water hangs out at the bottom if not done. Check with fork rather than spoon so you don’t mash the fluffy kernels). In the skillet you just used, toast the almonds over medium-high heat stirring constantly for about 3 minutes. 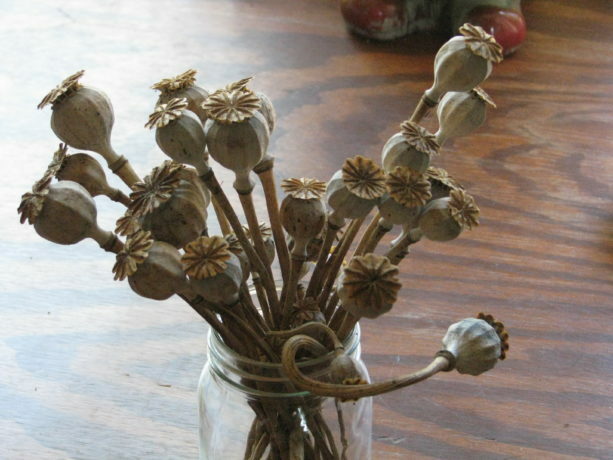 You should just start to smell them. Add cinnamon, a pinch salt and a little freshly ground pepper and stir for one minute. Add orange zest and ¼ cup water and stir until almost dry. When kasha is done, take off heat and stir in almond mixture and pomegranate seeds. Serve immediately. Makes about 4 cups; serves 4-6. Variations: lightly brown sliced onions and/or mushrooms and stir them in with the almond mixture.